Product prices and availability are accurate as of 2019-04-09 11:42:51 UTC and are subject to change. Any price and availability information displayed on http://www.amazon.com/ at the time of purchase will apply to the purchase of this product. Introducing Your New Favorite Cooling Racks ! 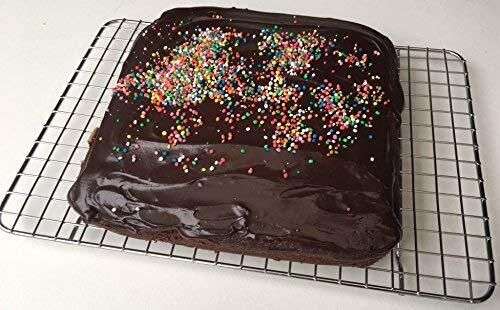 Following on from the success of our best selling half sheet cooling rack, which achieved perfect scores for both "Cleanup" and "Strength and Stability" in recent product testing by Cook's Country (America's Test Kitchen). 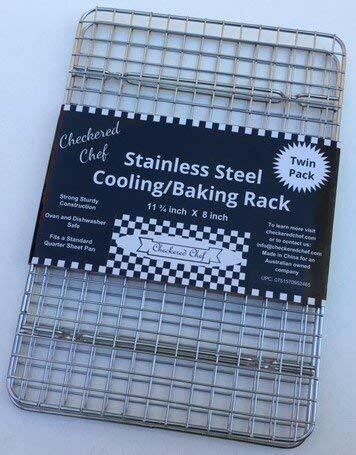 Checkered Chef is excited to introduce our new quarter sheet cooling racks. The ideal size for compact kitchens, RV's and countertop ovens or when you're baking for 1 - 2 people instead of a crowd. Cooling or Cooking - the choice is yours! 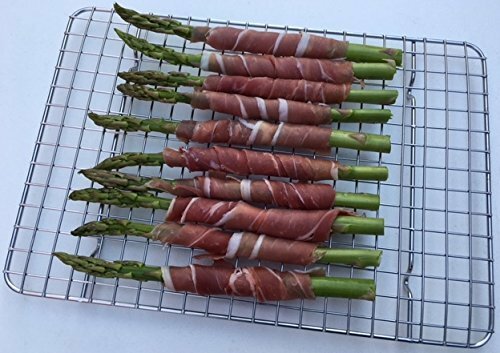 Solid stainless steel construction with no artificial coatings or treatments makes these metal racks warp resistant, rust resistant and 100% safe to use in your oven or broiler. 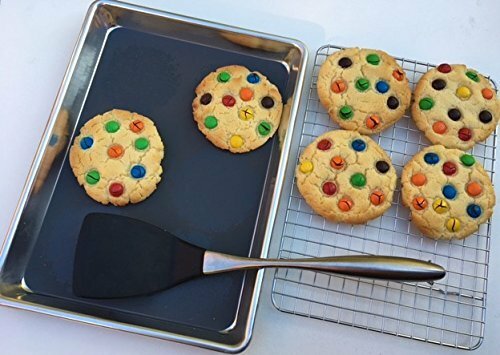 Use individually in quarter sheet pans or team the pair together to fit your half sheet pan or cookie sheet. Used as cooling racks for baking, the grid design allows for optimum airflow and prevents your treats from falling through - no more cookies sliding through the gaps! Great for cookies, cupcakes, muffins and more! Used as a baking rack, the grid design allows for even heat distribution and lets oil and grease drip through to elevate your food for healthier cooking. Perfect for baking and roasting, try some reverse seared steaks or finish fillets in the oven. Compatible with quarter sheet size oven pans, broiler pans, baking sheets and cookie sheets, these racks make the perfect cook's companion. Use them to crisp up some chicken wings, oven bake some bacon or even to broil meat in your toaster oven. And when you're done, wash up is easy. Simply hand wash or pop them in the dishwasher! It doesn't get easier than that! Sturdy, strong and versatile - no kitchen should be without these racks. Whether you are looking for a wire cooling rack, or a wire rack for baking, grab your twin pack today by clicking the "Add to Cart" tab above. Use as a cooling rack or baking rack- the choice is yours! With solid stainless steel construction and no artificial coatings or treatments, these baking racks are 100% oven safe. 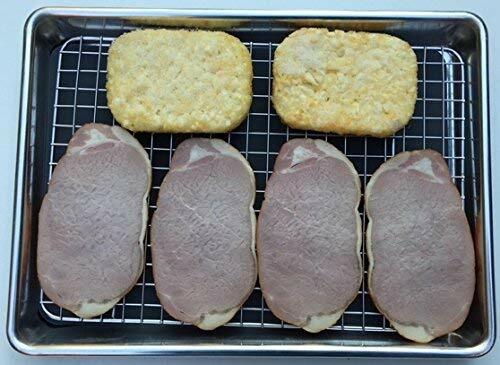 Perfect for oven baked bacon and chicken wings or as a cake or cookie cooling rack. The perfect size! 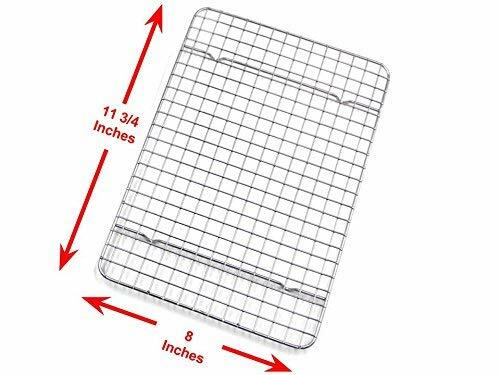 Great for compact kitchens, toaster ovens and RV's, or just when you're not baking for a crowd, each rack measures 8" x 11 ¾" to fit inside a standard 9 ½" x 13" quarter sheet pan or jelly roll pan, leaving enough space to easily insert and remove without spoiling your meal. 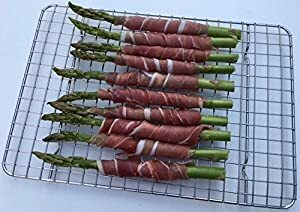 Alternatively, use both racks together inside a half sheet baking pan or cookie sheet to elevate and cook, broil or grill ribs, meat or fried food. Sick of flimsy racks that warp and twist? These 100% stainless steel cooling racks are designed for maximum strength and durability, and to resist warping and wobbling. No more cookies sliding through the gaps on this wire cooling rack! Our perfectly spaced crosswire mesh grid pattern optimises airflow and prevents your treats from falling through. Great for cookies, cupcakes, muffins, bread, cakes and more! Clean up is a breeze! Dishwasher safe! Every bakers dream - just like our best selling half sheet cooling racks, these quarter sheet racks can be safely washed in the dishwasher without corrosion or rust. Whether it's cooking, cooling, baking, drying, broiling or grilling, you'll find so many uses for these handy heavy duty cooling racks!